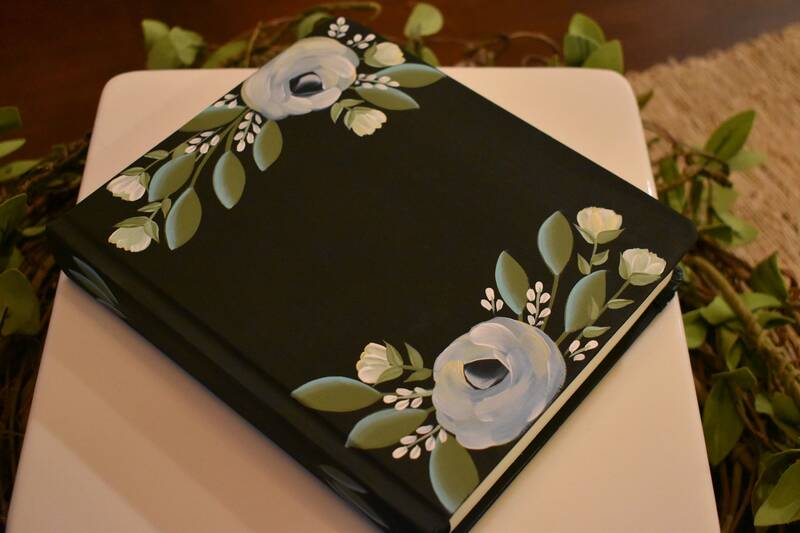 This listing is for a SEMI-CUSTOM bible design. Semi-custom means that the design shown in the listing photos stays the same but color and lettering (verse or quote) can be customized. **I carry both KJV and ESV journaling bibles in stock. Please select from the drop down bar which version you wish to order. 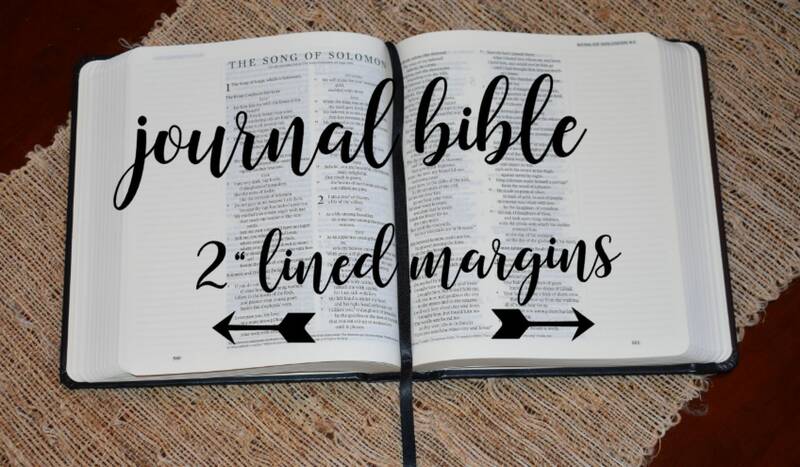 Journaling format bibles have a 2" wide lined margin for writing and note talking on each page. If you wish to have a different version please message me for availability and pricing. 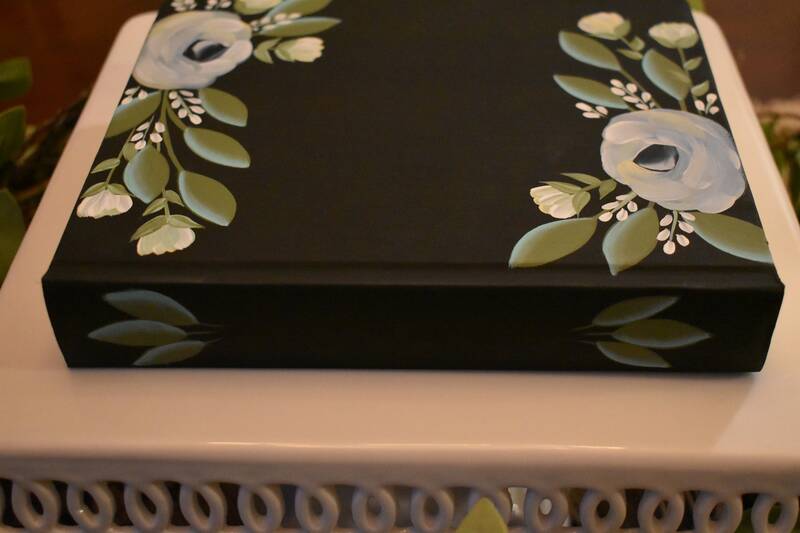 **Bible example shown is black with florals added in soft mint, shades of white and soft yellow. Foliage is added in olive and soft sage. Lettering recommended for this design is white. ** 1 SIDE OPTION-Price includes: Design as shown on front, spine and back. Lettering on the front and spine. Up to 14 words works best. Longer verses will need to be a mix of script and block style lettering to fit the text within the design. 2 SIDE OPTION-Price includes: All of the above plus lettering on the back. This can be first name/names, last name, initials, date or short verse/quote. **HOLY BIBLE will be on the spine unless something different is requested. Please message me before ordering with your verse request if different from what is shown in the listing example. I will need to verify that it will fit within the design. 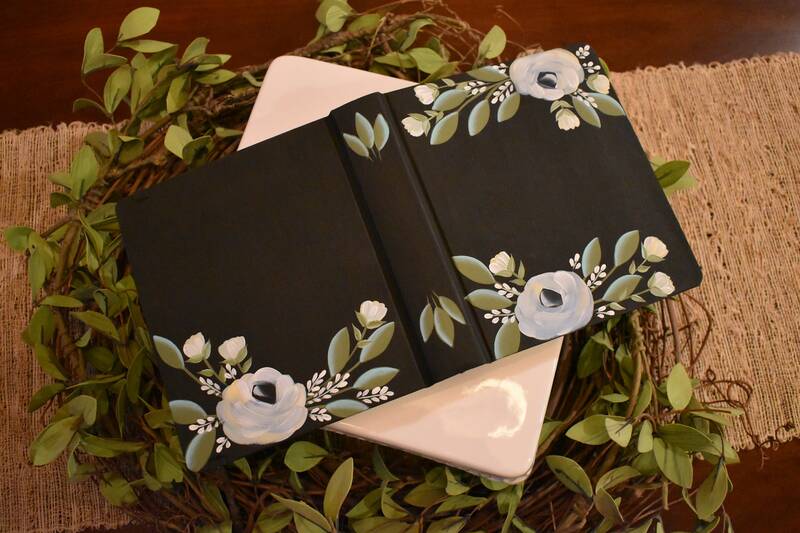 **Please note that these bibles are hand painted and intended for light use and keepsake purposes. Heavy use could result in damages, scratches/scuffs on the painted surface. Bibles will develop a small hairline split in the paint at the bend of the spine. This can not be prevented as paint is not intended to bend or crease. If using as a daily bible I recommend a carrying case for added protection. All lettering is hand brushed and will have some visible strokes. 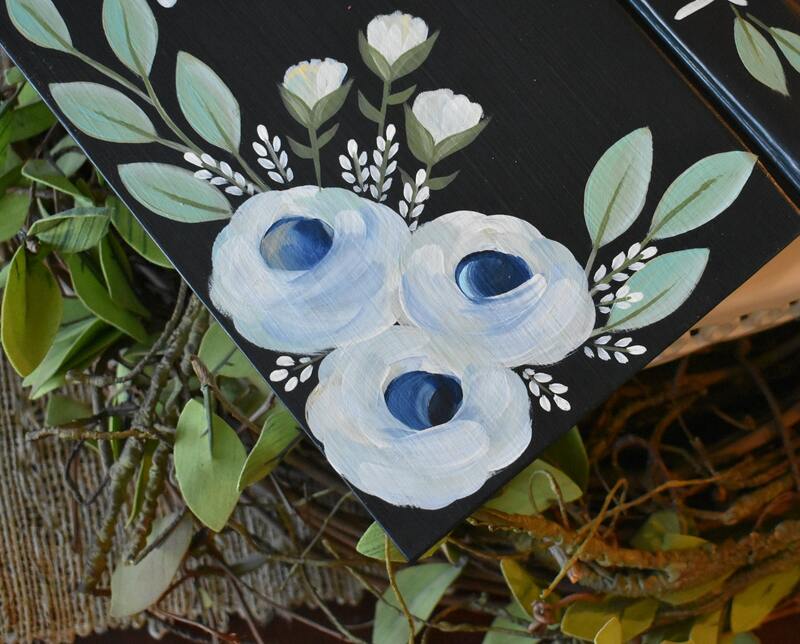 This adds to the uniqueness of the hand painted/hand made item!! **Please note that all bibles are painted upon order, no returns accepted unless there is an error on my part. 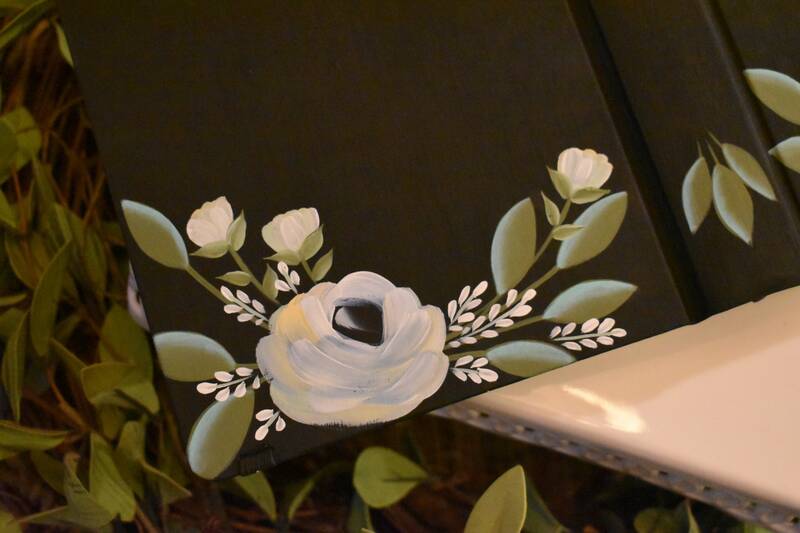 Florals will vary slightly in color from the listing photos as they are blended while wet. No two bibles will be exactly the same. 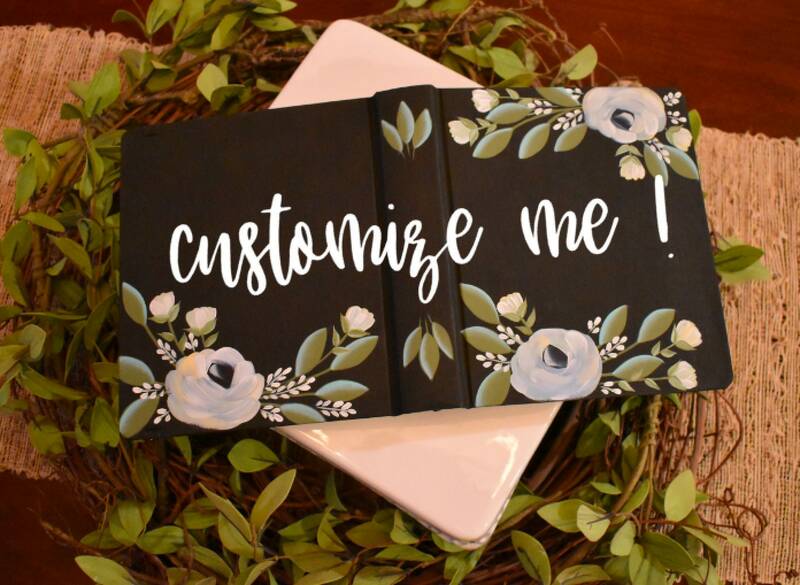 If a custom verse has been requested there may need to be adjustments in the placement of the leaves and florals to allow the custom verse to fit. **All bibles come with a linen drawstring bag.